Asuka 120% Limited ~Burning Fest. 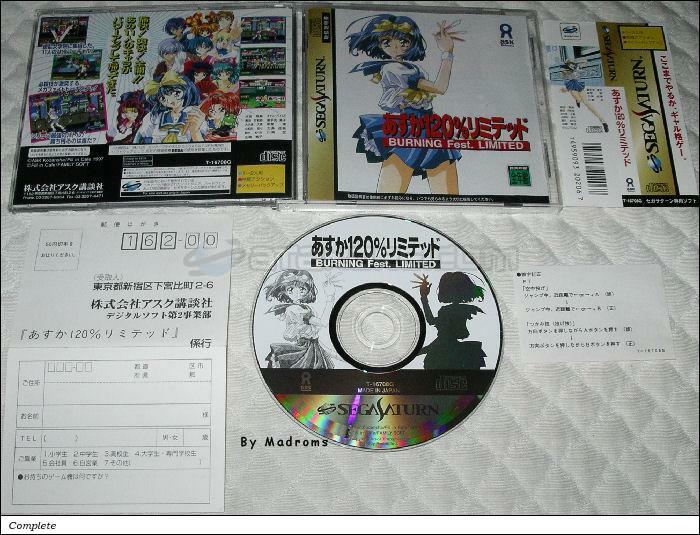 Limited~ (あすか１２０％リミテッド) is a Fighting 2D game, developed by Fill In Cafe and published by Ask Kodansha, which was released in Japan in 1997 for the Sega Saturn. Complete 10 hours of game play. Press Up to move outside the window on the character selection screen to choose Tetsuko. Press Down to move outside the window of the character selection screen to choose Genichirou. Hold L, R, or L + R , then press A when selecting a character to choose between three new color schemes. Press L or R at the configuration screen to access full gauge, auto block, life gauge, and other new options.